Why I Picked This Book: It's Heather Graham. I can't resist her books - especially not when they involve ghosts. My Impression: It's time for another Krewe book and time for the at inner voice who looks for plot holes to go on vacation! Because you don't want that voice around when you're reading this book. There's several plot points that raise the eyebrows if you think to closely about them. I really enjoyed seeing more of Jackson Crow in this book. He's a major character in the Krewe but for most of the last 6 books or so he's been at most a side character who mostly gives an order or two over the phone. While he's still a side character in this book he's a major one and it was interesting to see him work with Jude and be an active part of the investigation. Jude is one of Graham's almost faceless FBI agents. He isn't with the Krewe when the book starts but he's heard the rumors and he knows there is something unique about them. He's had his own paranormal experiences and isn't sure how he feels about them and is more uncertain when he realizes that some of the people he sees aren't actually here anymore. He's a nice man, intelligent, and willing to listen but doesn't have an overwhelming presence or personality. In my head he looks a lot like Donald Ressler from Blacklist because that's what I've been watching lately. Alexi is somewhat more fleshed out. She's been able to see ghosts her whole life and accepts that she sees them. She's suffered a traumatic loss and is very honest with herself about how she's handled it and what kind of place she is in her life. She's also honest with Jude about who and what he's seeing and is fully prepared for him to think she's crazy and somewhat pleased that he doesn't. The relationship does develop relatively quickly but it's believable. The setting of Haunted Destiny is fantastic. I love the idea of the historic cruise ship with more than it's share of secrets and I really loved the ghosts and their characters. Cruises have never really appealed to me but I would gladly sign on for a trip aboard the Destiny and would be even more excited if I could see Minnie and Blake and the World War 2 soldiers. Graham provides enough detail and context to flesh it out in my head without the details choking up the pacing of the book. As for the mystery itself has some giant leaping to conclusions. This is one of the creepier serial killers and the killer's connection to the cruise ship does make sense. However, Jude and Jackson narrow the focus on Alexi and her friend Clare being the next victims fairly early on and with very little evidence. This isn't a perfect read but it's definitely a fun one! I love Heather Graham's ghost stories best and this one didn't disappoint. As with all of the Krewe books they are very loosely linked and do not need to read in order. Would I Read More of this Series/Author? : Absolutely! 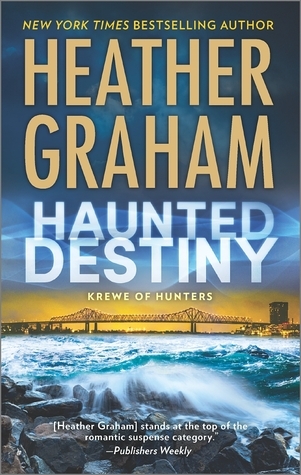 Heather Graham is always a good read and I love her Krewe books! Would I Recommend this Book? : It depends. If you're looking for a good mystery I'd pass on this one but if you're in the mood for a fun read with a little bit of heat and a good serving of suspense than definitely pick this one up! I love your comment about putting that voice in your head on vacation--the one that finds plot holes. :-) Some books demand it, don't they? I enjoy these books too and look forward to reading this one. While not my favorite series, I do enjoy these books! Ummmm you convinced me with the reference to ghosts. I love ghost stories. And I've been wanting to look into Heather Graham. I don't mind if the mystery isn't the star here. I think books don't always have to be perfect in everything, so long as it has enough of what we love they hook us. I haven't read Heather Graham, but you never know. At the moment the only suspense series is the J. D. Robb one and I want to complete or catch up with that first. I don't think I've read one of her books but this sounds pretty good so I'll add it to my list! The author is new to me so I appreciated this post as I am always on the lookout for new authors. I enjoyed this one too Katherine. I am reading the next book now set in Alaska and was surprised to find some of the characters from this book.